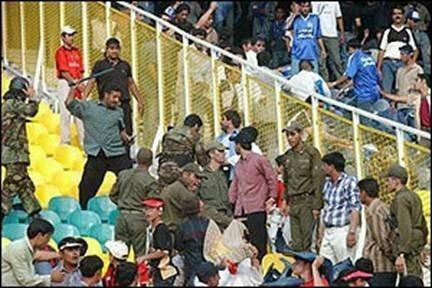 Six Iranian students were killed Friday 25 March 2005 and more than 40 others wounded, some of them critically at the end of a decisive soccer match between Iran and Japan, making it the worst after-soccer incidents in Iran. Though the Iranian clerical ruled authorities said they were killed in “stampede” at one of the smaller gates of the huge Tehran Azadi (freedom) stadium, but eye witnesses said police had fired on happy young boys and girls signing national songs and shouting slogans against the Islamic Republic and some of the most senior clerical leaders. Football match is usually a good occasion for young and middle aged Iranians to show their dissatisfaction with the theocratic regime by organising on the spot demonstrations that leads to clashes with Law Enforcement Forces, but analysts said this was the first time that so many people had been killed ands wounded. “The stampede started after riot police fired in the air, trying to disperse the happy and enthusiastic people who had just got out the stadium from principal entry gates and joined the group outside, singing national song, dancing and shouting”, one source reported. “The revolutionary guards attacked thousands of youngsters who were singing the Iranian nationalist song, “Ey Iran” (a song forbidden by the Mullahs). So far dozens have been arrested”, the Los Angeles-based Iran Press News reported, though there were no words of arrest from the authorities. A significant number of women’s groups gathered in order to protest the on-going forbiddance of women to attend the football matches. Many women and girls were arrested and removed to detention centres as other demonstrators were severely beaten with chains, nightsticks and attacked with tear gas. Athena has a terrific link via Publius Pundit that shows some amazing pictures of the riot. There are also scenes from outside the stadium where the women had congregated.